1.) Real Water is guaranteed delivered to your home within 24 hours of being bottled. Ask your current delivery service how old is the water you're getting from his company or just read the date code on bottle. 2.) Real Water is bottled and stored at 75 degrees or below. Ask your current delivery service at what temperature is the water from his company bottled and stored. 3.) Real Water is bottled direct from aquifer; no tanker trucks with chlorine added. Ask your current delivery service how their water is bottled. 4.) Real Water is unaltered, only filtered and ozonated as required by state. Ask your current delivery service what is removed or added to their water. 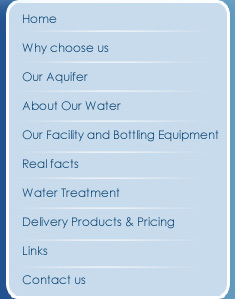 Also, ask them for finished product test results from the source of your water - not the results on website. This is not the same water you get. It shows all 25 distribution locations from California to New York have the same test results. How is this possible? 5.) Real Water does not require a contract. If you choose to cancel your delivery service at any time for any reason, we will not charge you anything but monies owed for rental and water. Ask your current delivery service why you can be charged up to $100.00 for canceling their service before multi-year contract is expired. 6.) Real Water is currently delivered with our super efficient diesel vans within a 12 mile radius of our bottling plant, saving huge amounts of fuel and exhaust fumes. We will be totally on bio-diesel in 2008, and our facility will be green by the end of 2008 or carbon neutral. Ask your current delivery service how much fuel is used between their bottling plant and their distribution warehouse; how many miles per gallon does there huge truck get; and when will they use alternate fuels, be a green company or carbon neutral. 7.) Real Water is owned and operated in Walker, Louisiana by Richard McDonald who also lives in Denham Springs. Ask your current delivery service where their owner operates and where does their owner live. 8.) 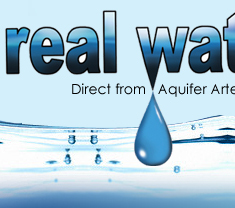 Real Water is $2.00 less for five (5) gallon artesian and $3.00 less than distilled from the local competitors. Ask your current delivery service why their prices are so high. 9.) 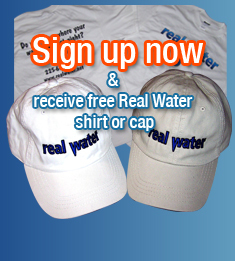 You get your choice of Real Water hat or shirt for signing up FREE! 10.) You get your first month FREE with cooler rental! 11.) Real Water tastes great! Does yours?